With the summer holiday season coming up, thousands of South African families are planning family getaways. 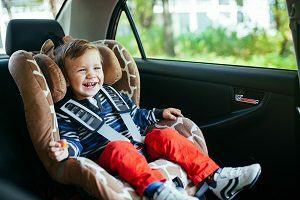 However, while it’s exciting to pack up the family sedan, get the kids strapped in and leave, it’s also often fraught with danger on SA’s roads. We at Earn-A-Car care about our client’s safety. Not only do we provide the best opportunity to own a vehicle to help you afford that family holiday, we also want to offer some tips to help keep your littlest ones safe on the road. Follow the instructions that come with your baby car seat. They are essential for the car seat to afford the protection that it has been designed for. While it’s tempting to put your baby in the front seat next to you, infant car seats should be placed in the rear seat. Don’t put your baby’s car seat in the front, facing forwards, especially if you have airbags. If an airbag deploys onto a small child, it can be fatal. Infant car seats should always face backward, ideally at a 45-degree angle. Make sure the straps slide under your baby’s armpits. Make sure that your baby’s head doesn’t sit higher than one inch below the top of the baby car seat ‘shell’. If it’s higher, it’s time to upgrade to a bigger seat. Make sure your baby car seat is tightly fastened in. Make sure your baby car seat doesn’t wobble. If your baby is small, use a rolled blanket to pad the sides of the car seat to keep baby from moving around too much. Earn-A-Car offers the best vehicle rent to own solution in South Africa – even if you have bad credit or if you are blacklisted. All you need is the proof of your income that shows you can make a simple monthly payment of between R3 000 and R6 000 a month as well as a down payment amount of R16 500. You can own your own car in as little as 54 months. Contact Earn-A-Car today to view our range of quality pre-owned vehicles, and find out more about how we can help you find the perfect family vehicle, at the right price.